Home CDN , children , crafts , feature , holiday , holidays , homeschool , March , papercrafts , printables , US , worldwide March 18th - Featuring Bus Driver Freebies! March 18th - Featuring Bus Driver Freebies! -- Whether you only commute by bus, or run all your everyday errands on transit, show your appreciation through any way you can (try to keep it in moderation; drivers are more inclined to accept sealed food containers than a cookie produced out of your pocket). 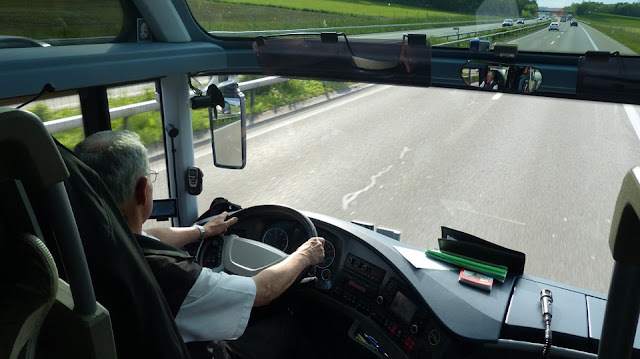 Even though it may be Bus Driver Appreciation Day, it certainly doesn't hurt to say a quick thanks to train or streetcar operators if you manage to catch of glimpse of them (as long as you are not disrupting them in the cab). -- Provides a rare look at life from the driver's seat. Spanning five years, this book is a collection of posts from a Portland, Oregon bus operator's blog about his job. From the unique perspective of a contemplative bus driver, this book chronicles Deke's career from trainee to seasoned operator. Sharing his adventures from the tragic to the wondrous or hilarious, he adds color to one of the world's most stressful occupations. • Bus Driver PC Video Game -- Your job is simple, transport passengers around realistic cityscapes and country sides following a planned route according to a timetable and learn the basics of professional driving by obeying traffic rules and taking care of your passengers. Earn points to work your way from a simple city bus to a school bus, double-decker tour bus or even a prison transport. • I'm a Bus Driver so Assume That I'm Always Right! -- Premium Quality Die-Cut 7 Year Vinyl Window Decal Sticker. Easy to Apply, Detailed Instructions Included. Perfect for Car and Truck Windows, Laptops, or other Clean Non-porous Surface. Free Practice Sticker Included. Proudly Made in America! 🚌 Have you thanked your driver lately? - Lace oatmeal cookies are thinner and crisper than their traditional counterparts. Although they are considered a Southern delicacy, feel free to whip up a batch in the name of country unity. It is a national holiday, after all. - A celebration established in 2000 by NASA and ESA. The purpose of the holiday is to popularize the knowledge about the Sun, and the way it influences life on the Earth. - If you aren't quite ready to forgive, write a letter to your parents, either addressing both mom and dad together or separately and say all the things you might not be able to say to them directly. You don't have to send the letter or hit send if you are drafting an email, but sit with it a while. - That brief moment in time when we feel inept, embarrassed, unsure, or uneasy. There are those brief seconds which seem like minutes and those minutes which seem like hours. It is time we lose some of our lofty self-images. It is that humbling period of time when confidence is replaced by uncertainty and the arrogant become mere mortals again. - Alexey Arkhipovich Leonov is a retired Soviet/Russian cosmonaut and Air Force General who, on March 18, 1965, became the first human to conduct a spacewalk. - Birthday of Rudolph Diesel, who invented the diesel engine and unveiled it at the World Fair in 1900. Diesel originally designed the engine to run on peanut oil and was a big believer in the role plant oils could play in fueling America. Biodiesel is a cleaner-burning, petroleum-free alternative to diesel which can be made from any fat or vegetable oil. This day honors the man whose vision comes full circle as biodiesel becomes an increasingly popular fuel. - Celebrates Aphrodite and other gods and goddesses of fertility. In ancient times, many cultures had multiple gods and goddesses. Each one represented various aspects of life. The ancient Greek goddess Aphrodite was by far the most well-known goddess of fertility. People would pray and make offerings to Aphrodite when seeking to create a family. If you are looking to procreate, today might be a perfect time. - Recognizes the ultimate sacrifice made by some for the good of others. History is filled with examples of people who offered the supreme sacrifice for other people. Today is a day to reflect and offer thanks and appreciation to those who made the supreme sacrifice for us.